A Florida sheriff’s office usually posts a “Sad Criminal of the Day” post, but one post received some negative attention. 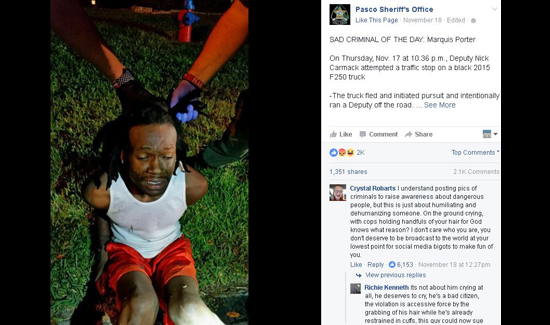 The Pasco Sheriff’s office posted a photo of a tearful criminal on the ground and being held by his dreadlocks. The post has garnered more than 2,000 comments and shared more than 1,300 times. “I understand posting pics of criminals to raise awareness about dangerous people, but this is just about humiliating and dehumanizing someone. On the ground crying, with cops holding handfuls of your hair for God knows what reason? I don’t care who you are, you don’t deserve to be broadcast to the world at your lowest point for social media bigots to make fun of you,” one Facebook user wrote. Another user didn’t mind the tears, but felt the hair grabbing was excessive. The sheriff’s office posted a video clip, which shows a deputy asking the man if he was alright. The post also went on to say the post was no different than any other posts they’ve done. “Over the weekend, a post on our social media has generated some interest. This post is not different than others in the past, we try to always be open and show the citizens of Pasco what their Sheriff’s Office faces on a daily basis,” according to the post.